Summer is in full swing, my friends, and that means the mercury is staying high for a good while longer. Presently in Los Angeles (about ten miles inland) it is a balmy 80 degrees, with an expected high of 90 for tomorrow. And believe me, I know there are some of you reading this who would kill to have it be that "cool" right now. It's times like these when I just can't believe how few tank tops, shorts, and sleeveless dresses I have (which is a total lie because I have plenty, but I go through them so quickly when the weather is this warm, and then it's awful because I have nothing to wear) and I just want to take all my pants and turn them into cute little cut-offs. In fact, sometimes I ask myself why I was so stupid to buy all these pants. When will I ever use them? (And then I remember January when I cursed myself for having so many dresses because I was tired of wearing my favorite jeans over and over again). C'est la vie, I suppose. But if you can spare an old pair of pants - or better yet, score an old pair of Levi's at a vintage or thrift store - I highly recommend getting a little crafty and preparing yourself a pair of cute cut-offs to get through the rest of summer. 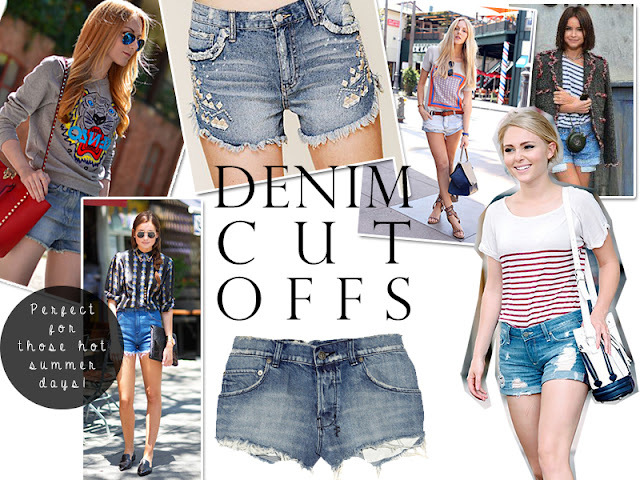 They are all the rage right now (clearly, if street style mavens like Miroslava Duma and young starlet AnnaSophia Robb are rocking them) and it seems easy enough to turn a pair of worn jeans into perfect summer shorts.